The RK2 RK Series Rack from Middle Atlantic is a 2 RU rack enclosure designed to house studio rackmount gear. Its MDF construction features a black-laminate woodgrain finish. This RK Series Rack includes a steel rack rail and a set of hardware for assembling the unit. It can house up to 200 lb worth of gear. 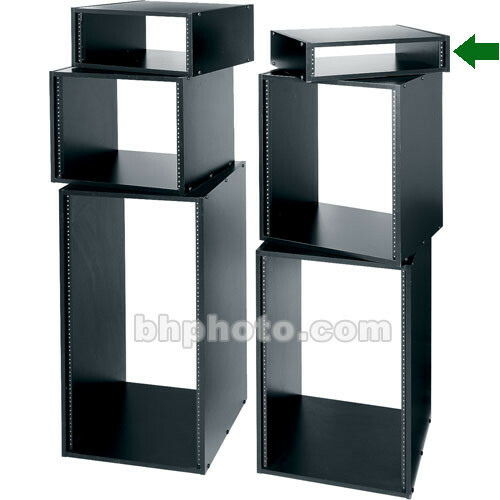 Box Dimensions (LxWxH) 25.0 x 20.0 x 6.0"
RK2 RK Series Rack (2 RU) is rated 5.0 out of 5 by 4. Rated 5 out of 5 by Don Les from Perfect sturdy 2 space rack This rack is exactly what I was searching for...it matches my music production desk perfectly and it's definitely sturdy enough to support my iMac computer and rack mount audio interface. Rated 5 out of 5 by Kent M. from Excellent rack We added a quad monitor display to our church's video system, and needed a 2U rack to place on top of our existing 4U rack. I was very pleased with the quality of the unit. It was very easy to assemble. Everything fit perfectly. The width and depth is exactly the same as our 4U rack, plus the black oak grain finish matched exactly. Rated 5 out of 5 by Podcastgroove from Great Product! I Love It! This is the second rack I've purchased. The unit is sturdy, with quality parts for easy assembly. I love the black laminate look and my audio processing gear looks cool housed in this great product. Rated 5 out of 5 by tss211 from VERY SATISFIED Quick assembly. Personally wanted it for a desktop rackmount beneath computer monitors. Can I keep the Middle Atlantic RK2 RK Series Rack (2U) on it's side? I want to put it under my desk but next to the desk leg. I keep a Audio Mixer and PDU in the Rack. If the equipment doesn't mind the position, I doubt the rack will mind at all. I would be sure, positioning it sideways, that I had four rack screws in each piece of gear. Is the finish a black oak grain like the Raxxes racks?